ASRL’s non-partisan journalism ethics program, iMediaEthics promotes the media’s use of scientific methods and experts before publication. Our journalists, student interns and contributors publish media ethics news and investigative reports based on in-depth research. Methods are objective, not people. From brief reports to continuing investigations, we hold the media accountable by examining concrete, measurable errors of fact and ethical breaches encountered in the press. 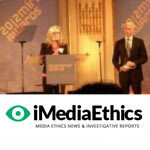 iMediaEthics’ mission is unique and differs from other journalism sites in its focus on the knowable, the testable, the verifiable—in short, the facts. We have no agenda beyond advocating for factual, ethical reporting. The intent of our case studies is to improve journalistic fact-finding and fact-checking methods and practice. Practical tools and discussions target the skills needed by both readers and writers for testing and discerning facts from lesser parcels of information. Education is also a key mission. Through our “Resources for Educators” section, iMediaEthics neatly categorizes our stories by journalist, publication and subject. This system allows for easy access to stories on a given subject or those published by a specific journalist or newspaper. Remember the early days of “current events” in classrooms? The teacher would have us read and discuss daily news stories in the newspaper. The basic educational concept was that with students becoming aware of the news around them as passive consumers, they would somehow become informed and better citizens. Old-time “current events” were fine for the days of “Ozzie and Harriet”; but what about today’s age of reality television? Now the average person experiences him as more than a passive consumer. There is an increasing expectation that citizens of all ranks are entitled to be heard in the mass media. They are actively asserting their voices on the Internet. ASRL has come up with an updated concept of “current events” for students that suits the new Internet age as well as the need for inclusion, openness and dialogue between the media and its consumers. To publish a case, students simply register and get a password for access to making entries on the “open blog” site. Technical assistance such as uploading images would be provided by ASRL staff. The “Check Your Facts” website would contain a teacher’s curriculum guide and “how to do research” tips for students. These materials would be developed with help from Stanford and University of Washington at Seattle faculty. (On staff we have a PHD student from Columbia University’s School of Education). Each published case will have a number. Registration will include media outlet name, article/program name, author’s name and date. CheckYourFacts.org site will track, update and post statistical results of students’ entered cases, consisting of numbers of cases per media outlet; journalist, producers or editors and programs or articles. If we had armies of students doing this kind of work, the public’s present belief–that the media lacks transparency and accountability–would be changed. If the CheckYourFacts.org program were run nationwide, one can envision the creation of a society of sophisticated media consumers, and a journalism culture of more uniformly accurate reportage following suit. “Weighing Facts in Science, Law, and Journalism: Arabic- and English-Speaking Perspectives and Disciplines Compared” is a proposed conference that will focus on the verification process in science, law, and journalism. In science, we trust scientific facts because they are repeatable and thus proven to be reliable. However, in journalism, “facts” are taken as irrefutable statements without any objective or standard verification process; we simply trust the media to be accountable in their reportage. This conference, sponsored by Egyptian based Alexandria Library’s outreach program, Pharos Lighthouse Project, and the ASRL of New York, will bring together scholars, faculty, and graduate students from the fields of science, law, and journalism to examine case studies that will spur discussion about and proposed solutions for how the methods and standards of verification in journalism can be brought up to the rigorous standards of those used in science and law. Find the facts behind the reporting!!! SetTheRecordStraight.org will allow sources quoted in the media to tell their whole story. Sources can correct the facts and reveal their perspectives of how they were treated by journalists.